This post is offering to those of you who celebrate Mabon & Equinox. It contains some links, articles and recipes to inspire you as we enter Fall. Have you ever made such a powerful change that it leaves an imprint, not only on your life, but on the very time of year it happened, for many years after? It's that way for me at fall equinox. Powerful changes come to me now in the fall. I quit smoking for good at equinox, as I said, after dozens of other attempts. I wondered then where I would be a year later. When the wheel had turned, I stood in circle, holding hands, as a group of us honored a dear friend and mentor. Her two year old danced in the redwood grove while we remembered her mother and I thought "Carpe Diem". I think that every year around this time. That girl is in her 20's now, happy and healthy and tending to children of her own. Mary, if you're watching, you must be pleased. Mary was smarter then me in many ways. She never smoked. Nevertheless, she died of heart disease - another cruel killer of women - when she was only 40. So today, in her honor, I'm going to ask, "How is your heart health?" If you don't know that answer to that question, maybe it's time you saw your doctor. Like my own said, learn and live. Many years ago at this time I also forgave some childhood hurts that had been a difficult burden. I've felt lighter ever since. Soon after another equinox, I left a long relationship and began a Saturn Return that left me breathless and shaken, but whole. Years later when I was living more of my life, and not someone else's, I began new work worth doing. The harvest that choice produced has blessed me to this day. 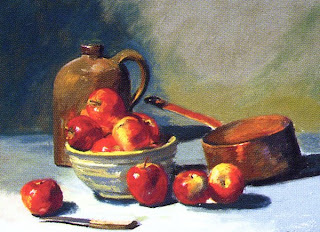 So that's how it goes; change comes to me in the time when the apples ripen and fall. 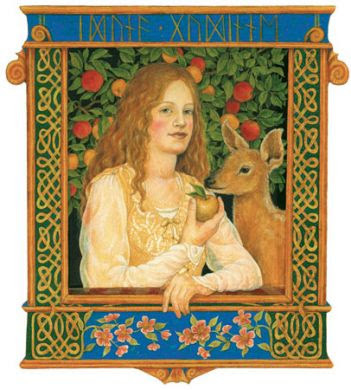 As I scatter small Gala apples for the deer who come to our meadow, and begin to make Pink Lady pies, I watch and wait for the lesson. Meanwhile, dog and I are going on the road. We'll be staying with old friends and hiking in well loved places during the fall holidays. Dog wants me to take a rest from the computer. Madame, I hear and obey. I'll take up the blog again when I get back. Excerpt: It’s amazing how quickly the oppressive thoughts of late summer evaporate as the world opens and shines holy like a morning glory in mid-September. I am half rock n’ roll and half gregorian chant as I stare down the long, golden road of fall - noticing as I drive the long dusty farm roads to various appointments, how the corn turns a rusty shade of red and blushes new as a peach at sunset. How the rain comes cold and sweet like a lemon. How the creeks lap at the grass and wax blue as the best evening sky. And here I sit in the breathless perfection of creeping spectacular death - the tending to the sleeping bed of the Mama before her long, ancient nap - and….well, it’s hard to stay irritated when the world is just so freakin’ gorgeous. Excerpt: I swear by all that's holy (and, let's face it, I'm a witch.I think that it's all holy. The pretty stuff: the flowers and the mountains and the flowing river and the sunlight on the water and the softness of a baby's cheek and the maiden's blush and an eagle and waves and firelight and brave deeds, and the widdershins stuff: the worms and the decay and the mold and the spiders and the cold and the dark and the crone's greed for the warm spot by the fire and the fear and the death. So, it's a lot to swear by) that yesterday, when I drove home from work, the trees along the Potomac River were green. And, tonight, literally overnight, they've begun to turn yellow and brown. As if Mother Earth were saying: here. Here's the boundary. Excerpt: In these modern times, a spiritual way to look at this time of year is, what did you harvest and bring to your hearth this year? Give thanks to the God and the Goddess for what you have been able to accomplish. Cut away the chaff, the useless things and situations that are slowing your life down. Since we are coming to the end of our Pagan year, what can you hope and plan to accomplish next year? How can you spread some of your good fortune around to others who are needy? How can you work to balance any conflict that is around you? ... It is also time to thank the God and the Goddess for the special people in your life. These things are your modern day "Harvest." Elizabeth’s pictures suggest there is no obligation to strive for something other than what is or to strive to explain everything fully. They have an acceptance of transience. the illusive, and the natural processes that break down everything except the loving eye that bears witness to this brokenness...Flowers never try to hold onto this peak moment, because going to seed is as important to them as their peak moment of beauty. Unlike our culture, they make no effort to hold onto some impossible moment of eternal youth. And this surrender is not a loss. The gardens have a deep beauty and gravitas as they pass into fall and winter. Plant architecture may be broken, but in fall, the gardens have great heart and wisdom. Happy Fall Equinox and Blessed Mabon to all here.